Shown above with a pair of CoolCat fans (available separately). CoolCat started with a clean sheet of paper, and the result is this beautiful Aluminum radiator for Series II E-Type. 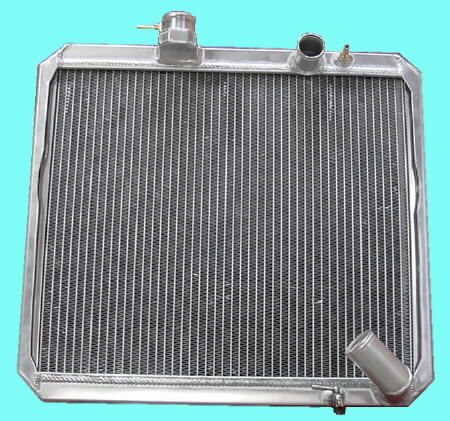 This radiator will cure your cooling system issues. All brazed aluminum construction assures the maximum possible heat transfer. 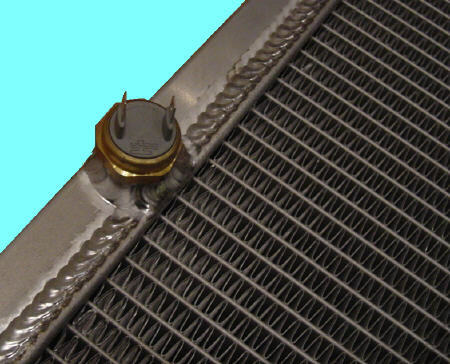 This radiator is designed to mount precisely in the Series II engine bay...the original shroud will bolt right up, the original radiator mounts will bolt right up, if you have A/C, the condenser will bolt right up. Hose fittings are compatible with your factory hose set. Rather than using an antiquated Otter switch, the CoolCat Series II radiator uses a modern 22mm fan switch. Replacements can be obtained at any auto parts store! The supplied switch is set for 185F, switches are available from CoolCat in various temperature ranges. Modern fan switch for long, trouble free service. The radiator comes complete with all mounting hardware, as well as a 22mm fan switch. The best value for your E-Type, available exclusively from CoolCat Express Corp.